There is nothing quite so wonderful as a perfectly seared piece of fish: Crispy crust on one side, just-barely-done meat in the center. It is one of the great tastes of the world, and it is my go-to method for cooking most any fish. I was primarily a seafood cook for 15 years before I ever touched a piece of wild game. Fishing is in my DNA, and I am proud to say my parents taught me well how to catch all sorts of sea creatures. I did not learn this technique from them, however. I learned how to sear a fish when I was a line cook years ago. Pan-searing is a classic restaurant method of cooking fish. The technique works on any fillet or fish steak. I am using striped bass here, but most fish will do. The only fish that don’t respond well to searing are those with lots of bones, like shad or very small fish, like sardines, or very thin fillets, like sole. It is not hard to master this skill, but there are some tips and tricks you need to know. A few things first. Most fish have very tasty skin if it is cooked properly. Some, like triggerfish or sturgeon or swordfish, have skin so thick or rubbery that it’s essentially leather. Others, like mackerel, have skin so thin you can’t get a decent crisp on it. But ye olde fish, such as bass, perch, salmon, flounder, snapper or rock cod, have excellent skin that crisps nicely. 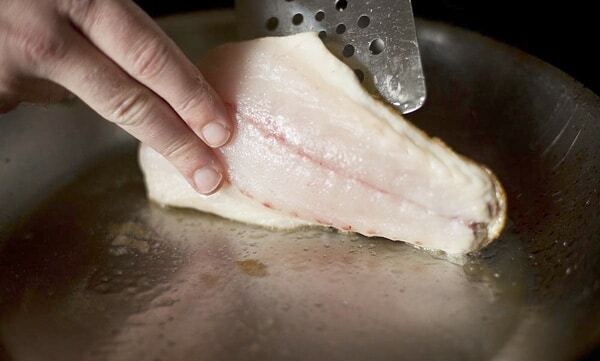 Be sure to scale the fish (or have your fishmonger do it), but leave the skin on the fillet. Keep in mind this technique works with skinless fish, too. Just sear the side the skin used to be on first. This method works best with boneless pieces of fish, either whole fillets or meaty portions of larger fish, skinless or not. This method works for many of the fish recipes on this site. And if you are looking specifically for salmon and trout recipes, click here. 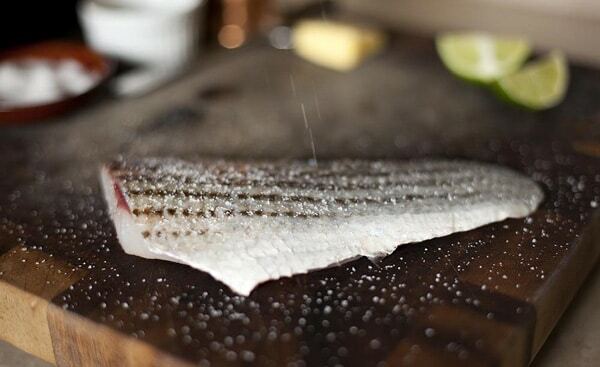 Take your fish fillets out 20 minutes before cooking and sprinkle a little salt on them. If it is a very thick piece of fish, like swordfish, let it rest at room temperature 30 minutes. When you are ready to start cooking, set a cast iron or steel pan (don’t use non-stick, because you can’t cook with these pans over high heat) over high heat until it is roaring hot. While the pan is heating up, take a butter knife and scrape down the skin side of the fish fillet to remove any excess moisture. If there is no skin, skip this part. Either way, pat the whole fish fillet dry with a paper towel. Pour the oil into the center of the hot pan. Swirl to coat the pan and let it get hot. If it starts to smoke, take the pan off the heat until it stops. Place the fish fillets skin side down. If there is no skin on the fish, lay it down on the side the skin used to be on. The moment the fillets hit the pan, jiggle it so the fish doesn’t stick. Salt the meat side of the fish. Turn the heat down to medium-high; medium if it is a thick fillet. Using a metal spatula, press down on each fillet for 30 to 60 seconds. Fish tends to arc when it’s seared like this, and you want the skin side to brown evenly. Don’t touch the fish. Let it cook undisturbed for at least a minute, possibly as many as 7 to 10 minutes, depending on whether you have a bass fillet or a sturgeon steak. The key here is to let 2/3 of the cooking occur on the skin side. That is what crisps the skin. The thicker the fillet, the longer the cooking time, and the lower the heat. When to turn? Sometimes never. Thin fillets, like on walleye, small striped bass, black seabass, Pacific rockfish — basically any smallish fillet — you can cook through without turning. You cook the exposed side of the fish by constantly spooning the hot oil over it until the meat turns opaque. This trick works very, very well with delicate or smaller fillets. 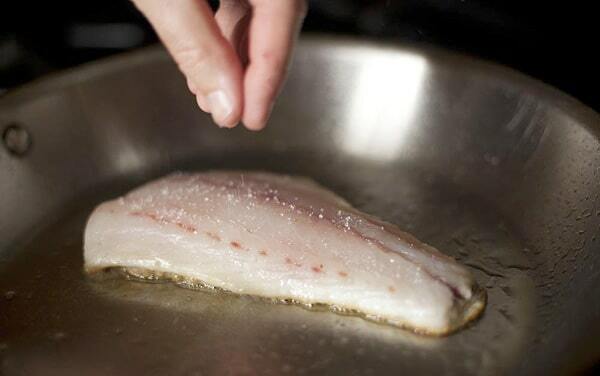 On thicker cuts, look at the sides of the fish and you will see the cooked portion climb up the sides; when the fish has a solid ring of browned goodness around the sides, turn. 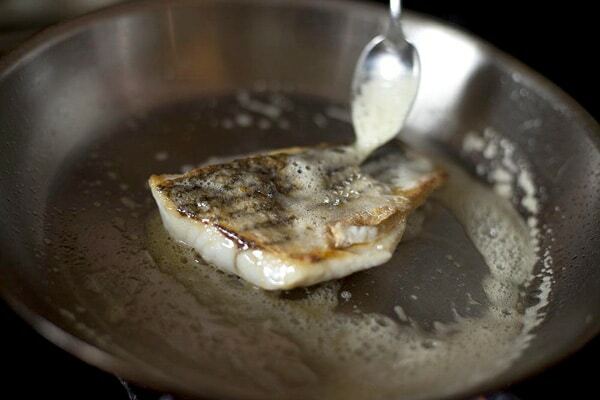 A good test is to shake the pan — if the fillet moves, you can flip. Use a metal spatula to do this flipping. Be prepared to scrape the skin off the bottom, as if it were stuck. If you have done this properly it will not be stuck entirely, but a few spots might be anyway. This is a critical step. It is vital that if the fish is really stuck to the pan to let it keep cooking! It will release when the sear is perfect. 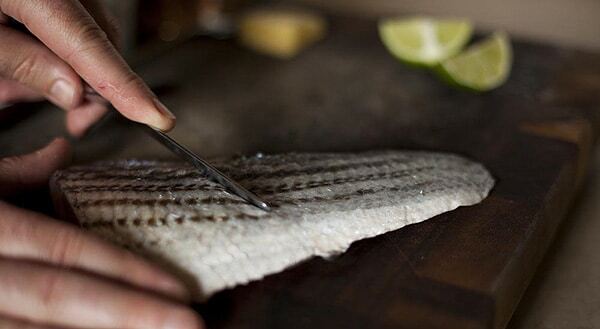 Once you have the fish dislodged, turn it with the help of your free hand stabilizing the fillet on the uncooked side. Gently turn. How long now? Again, depends on the width of the fish. But remember you did 2/3 of the cooking on the other side, so give it at least a minute for a small bass, 3 to 5 minutes for other fish. In most cases, your pan will be very hot, so you can turn off the heat and let carryover finish the job. Add a tablespoon of butter to the pan and swirl it so it melts quickly. Tip the pan and use a spoon to baste the fish with the butter. When the fish is done, serve at once: Unlike terrestrial meats, fish (other than swordfish and sturgeon) doesn’t like to rest. Oh, and that crispy, yummy skin? It goes on top. You worked hard for it, and you don’t want to ruin that crisp by exposing it to moisture. If you are using a sauce, it goes underneath the fish. Serve with a lemon or lime wedge on the side. Theresa: yes, if they can all fit in your pan in such a way that you can get a spatula under them. Made this on the spur of the moment tonight. Used Orange Roughy fillets from my favorite grocery store. Will make again! Finished with white wine to deglaze the pan, capers, and butter. Yummo! Nick: It’d need to be a big bluegill. So if you baste with the butter, does the skin stay crispy?